Karen Sims and her husband. DESOTO—With the largest graduating class in DeSoto ISD history crossing the stage Thursday night, families and friends were hustling to their seats to support our DeSoto High School’s Eagle Scholars. Among them was Karen Sims, a family friend of 2018 graduate William King. En route to her seat, Sims was made aware of the district’s bag policy at the stadium and asked her husband to take her purse back to their car because her purse was larger than the policy permitted. Unbeknownst to Sims’ husband, her wallet fell out of her purse as he hurried to drop it off and make it back to his seat prior to the start of the ceremony. The lost wallet which included a more than $1200 cash, credit cards, and identification cards. It wasn’t until they returned home that Sims discovered her wallet was missing. After searching their car, she decided she’d check with the police department in the morning. Not having collected any items that matched the description, Sims gave it one more try and contacted the district Friday morning to try to locate the lost wallet as she and her husband were heading out on vacation today. “As luck would have it, a member of the DeSoto High School Security team, Mike Williams, happened upon the wallet in the Eagle Stadium parking lot Thursday,” said DeSoto ISD spokesperson Tiffanie Blackmon-Jones. When district administrators made the call across the security radios to inquire if a wallet matching the description had been found and turned in, Williams responded to the call. 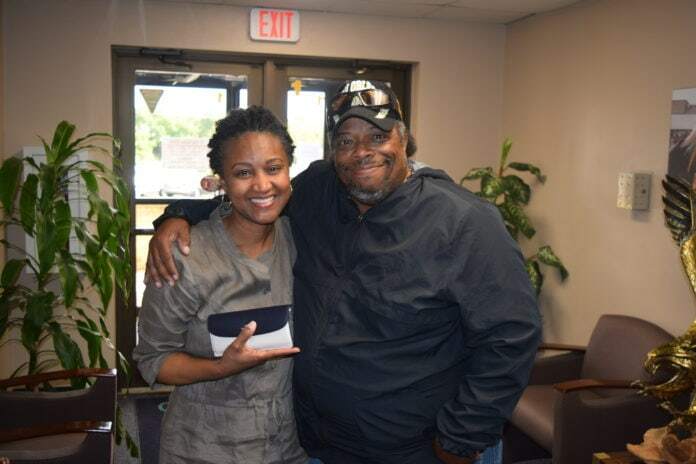 Hearing Williams’ voice over the radio, Sims burst into tears of gratitude and moments later, received her wallet fully intact just in time to make her trip.